A 290 square foot studio called The Darlinghurst Apartment was just named "Best Apartment in Australia" by Houses magazine. The micro pad, designed by Architect Brad Swartz, beat out a dozen larger flats with bigger remodeling budgets that were shortlisted for the same title. 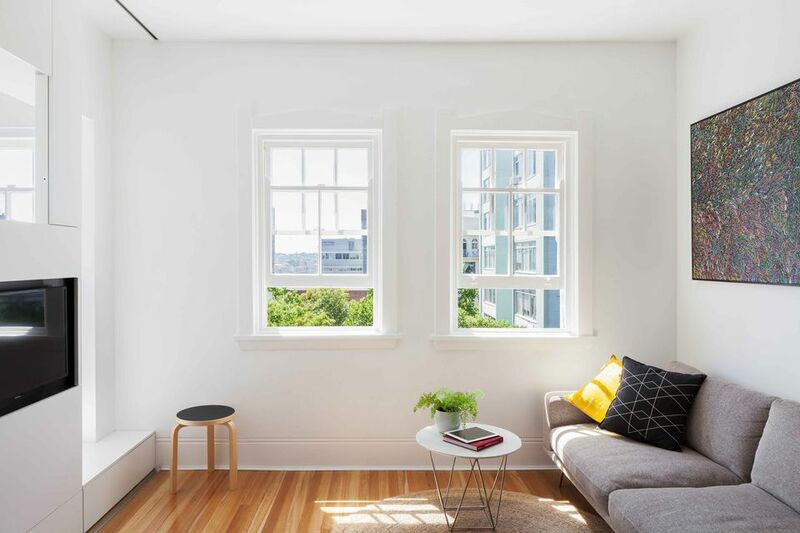 We share the winning combination of practical features and smart design that transformed this teeny inner city studio into a functional and comfortable home for two. Swartz and his partner currently reside at the Darlinghurst Apartment. He made the tiny studio more livable but dividing it into two distinct sections, a multipurpose living room that includes the kitchen, and a bedroom. A floor to ceiling storage wall adds interest and functionality to the Darlinghurst Apartment. Not only does it divide the studio into two separate rooms, but it also conceals a few practical features and useful storage. Here's what the unit looks like fully closed. Having a place to store wine in this super efficient apartment was a must for Swartz and his partner. So a modest wine cellar was built into the room divider. A vertical panel on the right side of the room divider functions as a pocket door that opens to reveal the bedroom. A much smaller horizontal panel under the computer unfurls into a desk. To enter the bedroom, you need to step up onto a storage drawer that keeps shoes out of sight. While floor space is tight in the Darlinghurst Apartment's bedroom, not an inch of space goes to waste. Cabinet storage lines the wall behind the head of the bed. Also, a handy shelf doubles as a headboard. The kitchen cabinets in the Darlinghurst Apartment conceal several kitchen essentials including a compact fridge. But the cabinet on the far right above the sink has a simple yet ingenious dual function that caught our attention. It's a drying rack that also doubles as dishware storage.